This recipe for Potato Cutlets with Asparagus and Eggs is a keeper. In fact, the ease of preparation, coupled with the deliciousness of the dish, might catapult this one into heavy rotation. Preparation just requires a few steps that and, again, the taste is amazing. Potatoes with asparagus – fried to perfection – and served with a dollop of sour cream and scallions. And while there are no breadcrumbs involved, they still achieve crispy and golden brown crust. Now that spring has finally arrived here on the East Coast of US, with it comes to an abundance of green asparagus. It happens to be the favorite vegetable of both my husband and me. Typically I make the asparagus the quick way, as a side dish, roasted with Parmesan cheese; but occasionally I fancy it up a bit and I use it in the dishes like this Turkey Alfredo Meatballs with Asparagus. 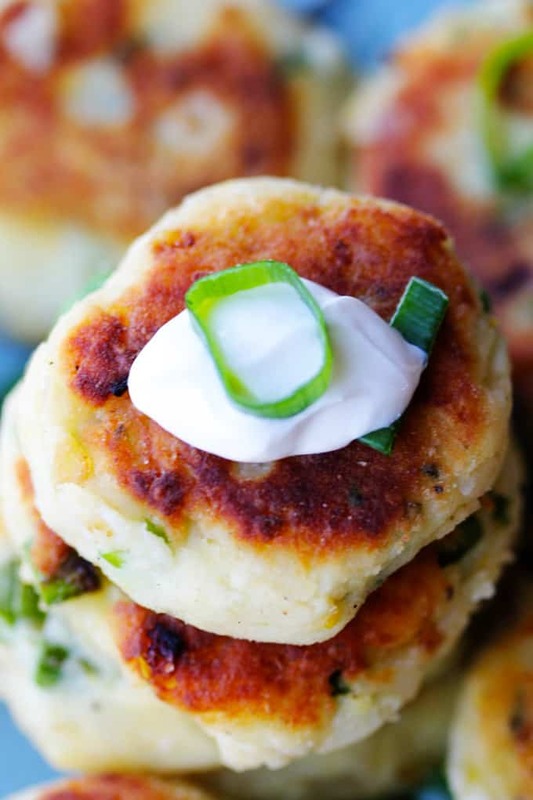 Frankly, when time permits, I do prefer to be a little creative with it, so I decided to incorporate it into these Potato Cutlets. When I was growing up in Poland, the potatoes were our main source of food. There would rarely be a meal where potatoes weren’t used. As a result, we frequently were left with lots of cooked potatoes leftovers. So my mom would come up with creative ways to use them. 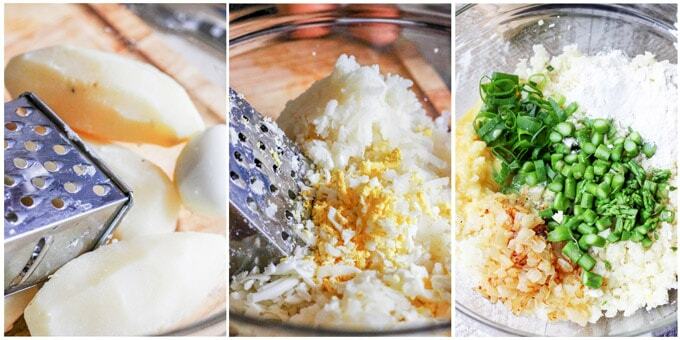 One of the ways was to make potato cutlets. She would just add some cooked & fresh eggs, flour, then bread them with some breadcrumbs, and finally just fry them up. I decided to recreate her recipe from scratch and throw in the asparagus. 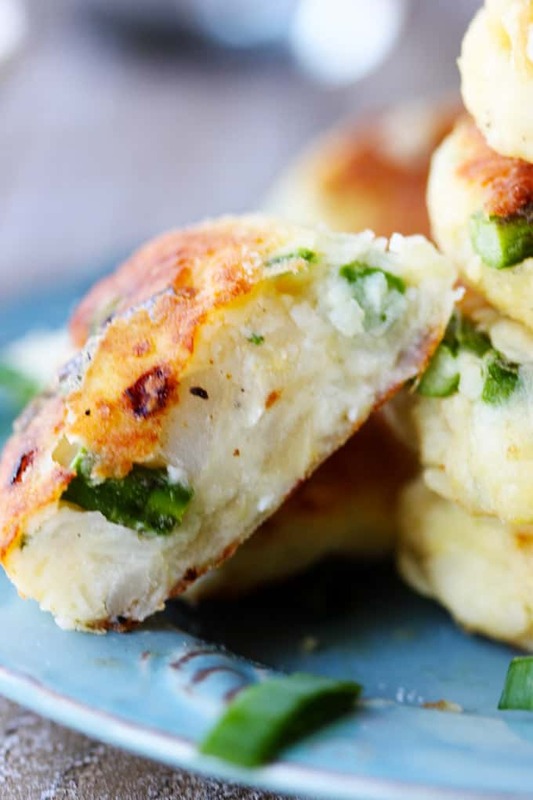 What ingredients are needed for this Potato Cutlets with Asparagus recipe? 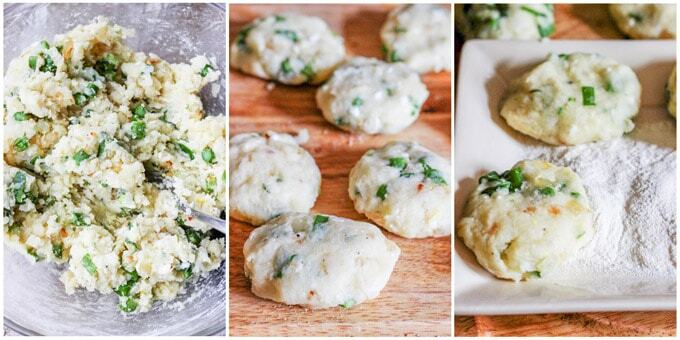 What steps are needed to make these potato cutlets? Step 11: Serve with sour cream and more scallions. 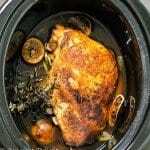 Ways to alter this recipe? What should I serve these potato cutlets with? 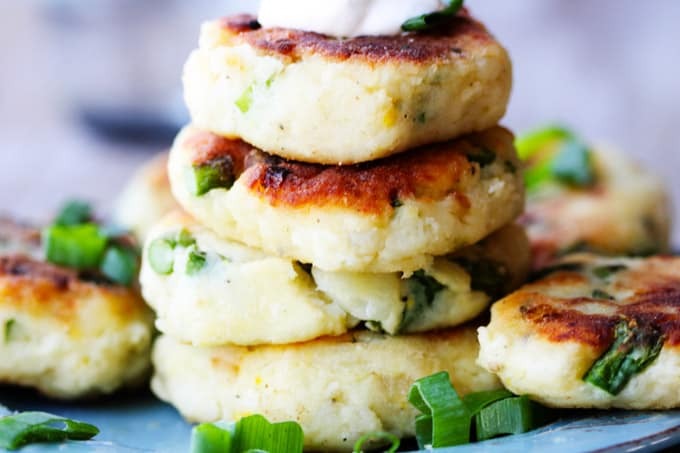 These delicious cutlets can be served as a vegetarian main dish, or as a side dish. If you want to keep it vegetarian, but not showcase it as your sole main course, then I’d suggest serving them alongside a fried egg, wild mushroom cream sauce or simple cucumber salad. This is a unique recipe, but it’s easy and impressive. 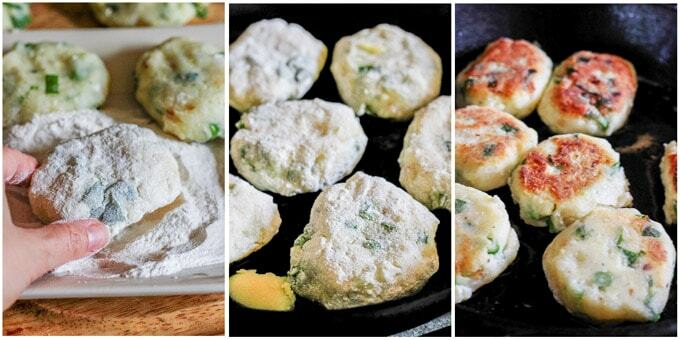 As opposed to regular potatoes, I suggest serving these awesome potato cutlets with asparagus next time. If you give it a go, then let us know how you like the substitute. Also, if you have kids, you may appreciate these as a great vehicle to sneak in some veggies into their diet. This recipe for Potato Cutlets with Asparagus is a keeper. In fact, the ease of preparation, coupled with the deliciousness of the dish, might catapult this one into heavy rotation. Preparation just requires a few steps that and, again, the taste is amazing. 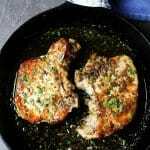 If your frying pan cannot fit all the cutlets, repeat the process. Serve with sour cream and more scallions. 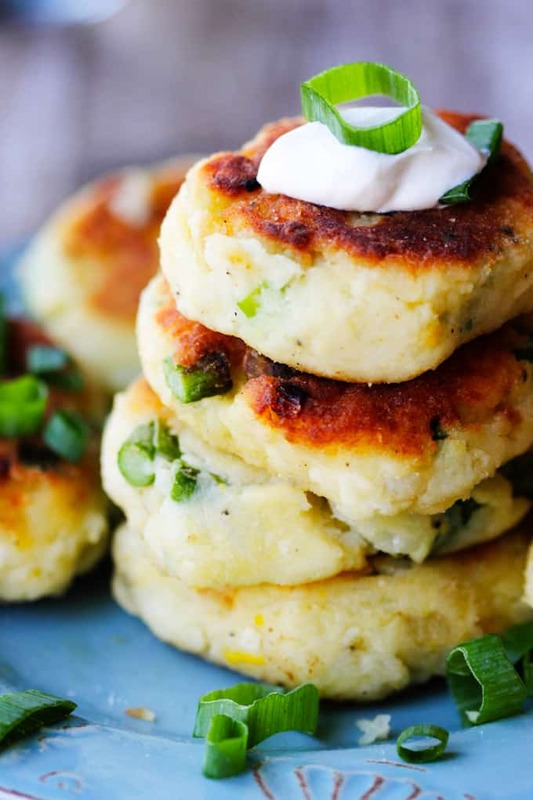 These potato cutlets look like the perfect side dish for anything off the grill. Love all the flavor that is happening inside. These look so tasty. Thanks Ali. Yes, this is a great side dish recipe for anything from the grill. 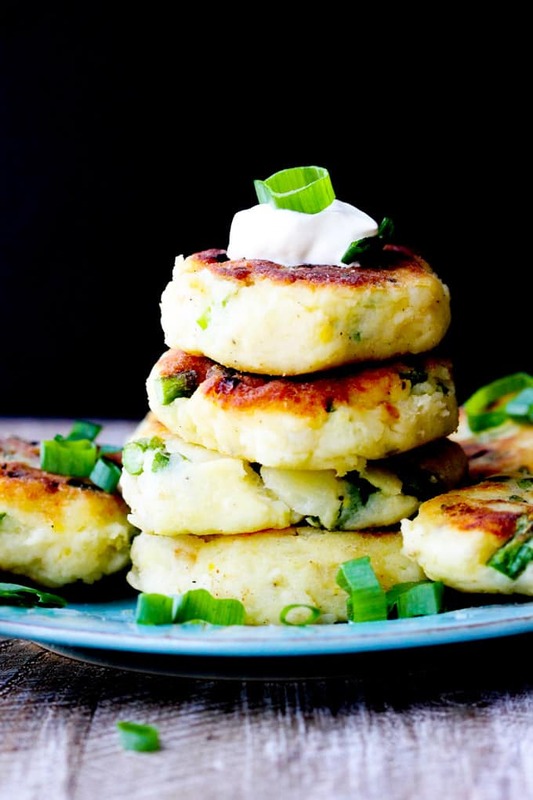 I love potato pancakes or cutlets as you call them. My grandmother used to make something similar to yours every weekend and we would devour them as soon as they came out of the pan. And a crunchy crust is a must! Did you ever just peel the crunchy part off and put back in the pan to crunch up again? Now I’m going to have to try my potato pancakes with asparagus in them ’cause that is one of my favorite veggies too. 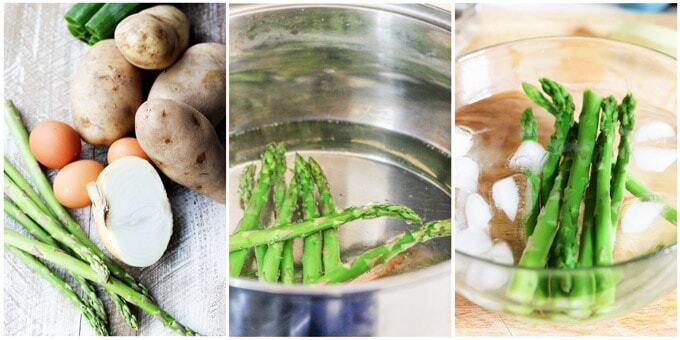 These look delicious–I love asparagus! Love all the suggestions for ways to adapt this recipe, too. 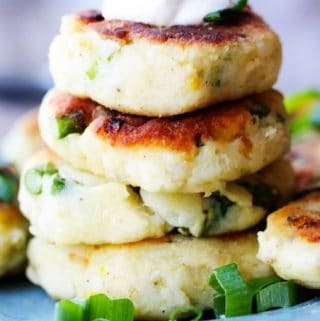 I’ve been a little flinchy with asparagus thus far, but I think I’ll brave these delicious potato cakes – if anything can help me get over my asparagus aversion, it’s probably potatoes. I am such a potato fanatic. 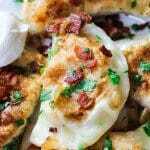 These sound delicious and would be great for brunch or dinner.